Instructions to reset your myNMSU password/passphrase. Beneath the red "LOGIN" button is the Forgot Password link. Click the link allow the system to redirect you to the "Reset Password" page. The Reset Password page outlines NMSU's passphrase requirements. At the bottom, enter your myNMSU username in the "Username" box then click the "OK" button to the right of the input box. After entering your username you will be asked to answer the three security questions you created when you first activated your myNMSU account. Answer these questions with your given answers then select OK. Note: If you are unable to remember the answers to your security questions, contact the ICT Help Desk at (575) 646-1840. Once you have correctly answered your security questions, the next window will generate a new password for you. 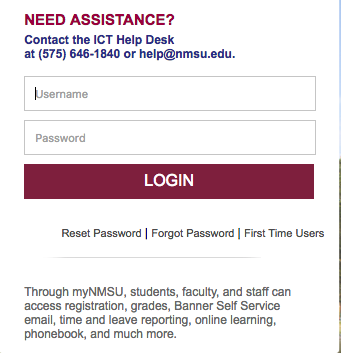 Select the generated password, copy it, and return to the "my.nmsu" login screen and log in with this generated password. From the Password Management menu, you can enter in a New Passphrase. The new passphrase will need to be at least 17 characters (this is the only requirement). Enter in your chosen Passphrase and Verify it before you click OK.
*Note: Resetting your passphrase will require you to also update your password on any mobile devices, drives, or email clients that your former password/passphrase was saved to or synced.